In The Score, I’ll preview the book after having read a few score pages. Spoilers will be limited to only that introduction. Update: spoiler filled wrap up review notes can be found here. 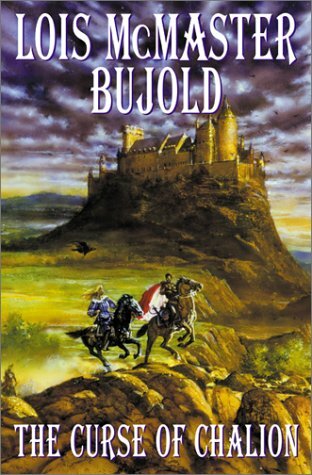 I was an instant fan of Lois McMaster Bujold years back when first reading a handful of the Vorkosigan books. The Vorkosigan Saga makes up a bulk of her work and is more sci-fi than fantasy, being set around interstellar intrigue around 1000 years in the future. However, with The Curse of Chalion in 2001 she started a three book series of fantasy novels, a genre that she apparently had wanted to get into for some time. The second of the series, The Paladin of Souls won her the Hugo Award in 2004 and added to her collection of sci-fi and fantasy nominations and awards. Not sure how I missed this book back in 2001 but it has shown up recently on some Goodreads list and probably on Sword & Laser. Looking back, I’m surprised I didn’t backtrack and read it since I did read Paladin of Souls (book 2 in the series) probably around 2006. The book is set in a land of kingdoms, royals and courts and high-fantasy elements like magic are not apparent as the book kicks off. We are introduced to the main character Lupe dy Cazaril or “Caz”, a minor noble as he is returning from a series of military campaigns which progressed somewhat tragically for him, ending with him apparently unjustly or mistakenly being sold into a cruel stint for over a year as a galley slave. The author goes to great lengths to illustrate early that he is a broken man, both physically and mentally. I tend to appreciate protagonists who aren’t perfect and have flaws or shortcomings to deal with, but Caz is presented in what seems to be an extreme case. Even so, there are glimmers that his character, wisdom and will are at least somewhat intact and we are set to hoping to see how he develops. While not much magic seem to be in evidence the author does introduce heavy elements of a multi-deity religion early in the book. It remains to be seen how strong a part these religious elements will play as the story progresses. It takes some time for the book to progress and for Caz to end up in his former court. His former royal patroness ends up enlisting his aid as a tutor for her granddaughter, a young, energetic and intelligent princess, and it is at that point we see the first glimmerings of a plot set before Caz. I’m consuming this book via Audible, mostly while out on summer marathon training runs. The narrator, Lloyd James does a great job and is easy to listen to. He creates a series of distinct voices for the characters that don’t seem to overly color the authors intent, which I appreciate. So far, I’m moderately enjoying the book and am interested to see how Caz develops. Keep an eye out for the wrap-up and review. Enjoy!